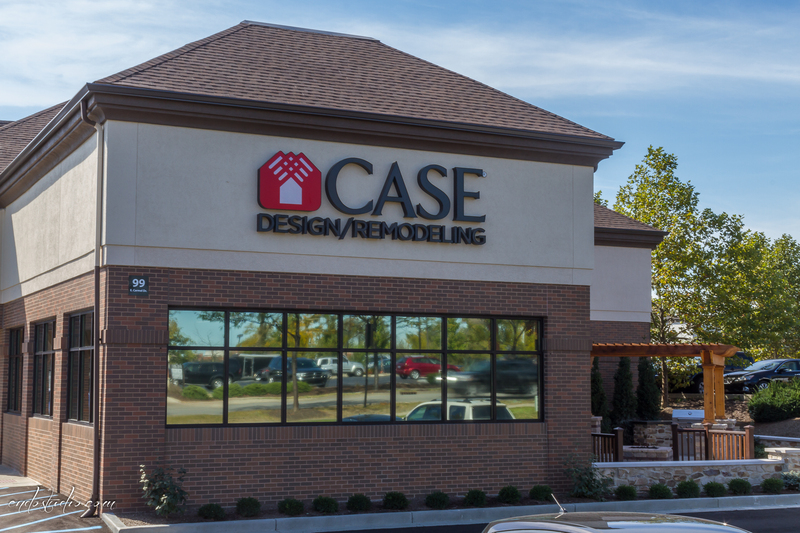 This Case Design/Remodeling remodeled building started out as a Fifth Third Bank and was converted into the new showroom with an expansion to the existing office area. The expansion included enclosing with a brick and glass exterior and repurposing the existing drive-thru and bank vault. The showpiece of the entire project includes an exterior patio that was converted from the existing drive-thru area with custom concrete finishes, a pergola, exterior lighting, custom decking and a stone fire pit. Kort Builders also updated the exterior with all new landscaping and reworked parking lot to add additional parking along with new light poles with LED fixtures. The biggest challenge on this project was working with the existing older structure to bring the building up to code while incorporating all of the different type of finishes. Case needed a commercial office but wanted to incorporate a residential feel to help showcase their design and construction work.